This article contains weasel words: vague phrasing that often accompanies biased or unverifiable information. Such statements should be clarified or removed. ক. Population and economy statistics and rankings are based data of the PCBS. গ. The territories claimed are under Israeli occupation. i. 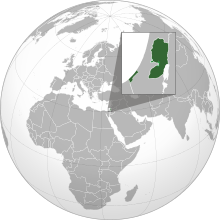 ^ Note that the name Palestine can commonly be interpreted as the entire territory of the former British Mandate, which today also incorporates Israel. The history was expressed by Mahmoud Abbas in his September 2011 speech to the United Nations: "... we agreed to establish the State of Palestine on only 22% of the territory of historical Palestine - on all the Palestinian Territory occupied by Israel in 1967." The name is also officially used as the short-form reference to the State of Palestine and this should be distinguished from other homonymous uses for the term including the Palestinian Authority, the Palestine Liberation Organization, and the subject of otherproposals for the establishment of a Palestinian state. ii. ^ The Palestinian Declaration of Independence proclaims the "establishment of the State of Palestine on our Palestinian territory with its capital Jerusalem (Al-Quds Ash-Sharif)." The same decision was taken also by the PLC in May 2002 when it approved the PNA Basic Law, which states unambiguously "Jerusalem is the Capital of Palestine". Ramallah is the administrative capital where government institutions and foreign representative offices are located. Jerusalem's final status awaits future negotiations between Israel and the Palestinian Authority (see "Negotiating Jerusalem", University of Maryland). The United Nations and most countries do not accept Israel's annexation of East Jerusalem through the Jerusalem Law of 1980 (see Kellerman 1993, পৃ. 140) and maintain their embassies to Israel in Tel Aviv (see the The World Factbook. Central Intelligence Agency). iii. ^ Israel allows the PNA to execute some functions in the Palestinian territories, depending on the area classification. It maintains minimal interference (retaining control of borders: air, sea beyond internal waters, land) in the Gaza Strip, and varying degrees of interference elsewhere. See also Israeli-occupied territories. ↑ Lapidoth, Ruth (২০১১)। "Jerusalem: Some Legal Issues" (PDF)। The Jerusalem Institute for Israel Studies। পৃষ্ঠা 26। ৫ জুন ২০১৪ তারিখে মূল (PDF) থেকে আর্কাইভ করা। সংগ্রহের তারিখ ৫ জুন ২০১৪। The attitude of the Palestinians was expressed inter alia in 1988 and 2002. When the Palestine National Council proclaimed in November 1988 the establishment of a Palestinian State, it asserted that Jerusalem was its capital. In October 2002, the Palestinian Legislative Council adopted the Law on the Capital, which stipulates that Jerusalem is the capital of the Palestinian State, the main seat of its three branches of government. The State of Palestine is the sovereign of Jerusalem and of its holy places. Any statute or agreement that diminishes the rights of the Palestinian State in Jerusalem is invalid. This statute can be amended only with the consent of two-thirds of the members of the Legislative Council. The 2003 Basic Law also asserts that Jerusalem is the capital of the State of Palestine. Reprinted from: Wolfrum, Rüdiger (ed.) (online 2008-, print 2011). The Max Planck Encyclopedia of Public International Law. Oxford University Press. ↑ Miskin, Maayana (৫ ডিসেম্বর ২০১২)। "PA Weighs 'State of Palestine' Passport"। israelnationalnews.com। Arutz Sheva। ৭ ডিসেম্বর ২০১২ তারিখে মূল থেকে আর্কাইভ করা। সংগ্রহের তারিখ ৮ জুন ২০১৪। A senior PA official revealed the plans in an interview with Al-Quds newspaper. The change to 'state' status is important because it shows that 'the state of Palestine is occupied,' he said. ↑ "State of Palestine name change shows limitations"। AP। ২০১৩-০১-১৭। ১০ জানুয়ারি ২০১৩ তারিখে মূল থেকে আর্কাইভ করা। Israel remains in charge of territories the world says should one day make up that state. ↑ According to Article 4 of the 1994 Paris Protocol. The Protocol allows the Palestinian Authority to adopt multiple currencies. In the West Bank, the Israeli new sheqel and Jordanian dinar are widely accepted; while in the Gaza Strip, the Israeli new sheqel and Egyptian pound are widely accepted. ↑ Bissio, 1995, p. 433. ↑ Bercovitch and Zartman, 2008, 43 (via Google Books). ↑ Staff (২০ ফেব্রুয়ারি ২০০৮)। "Palestinians 'May Declare State'"। BBC News। সংগ্রহের তারিখ ২০১১-০৯-২৭। But another negotiator and senior official, Saeb Erekat, disagreed arguing that the Palestine Liberation Organisation had already declared independence in 1988. 'Now we need real independence, not a declaration. We need real independence by ending the occupation. We are not Kosovo. We are under Israeli occupation and for independence we need to acquire independence', Mr Erekat said. ↑ ক খ control of the airspace and the territorial waters of the Gaza Strip. 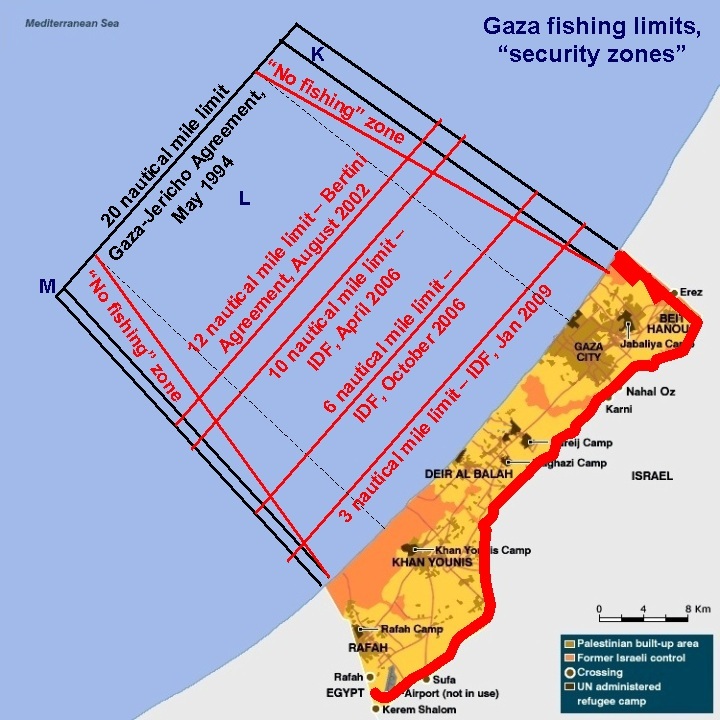 ↑ Map of Gaza fishing limits, "security zones". ↑ Disengagement Plan: Renewing the Peace Process: "Israel will guard the perimeter of the Gaza Strip, continue to control Gaza air space, and continue to patrol the sea off the Gaza coast. ... Israel will continue to maintain its essential military presence to prevent arms smuggling along the border between the Gaza Strip and Egypt (Philadelphi Route), until the security situation and cooperation with Egypt permit an alternative security arrangement." Cross, Tony (24 September 2011). "After Abbas's UN Bid Are Palestinians Closer To Having a State?". Radio France Internationale. Retrieved 2011-9-28.